If you are thinking of renovating your shower area and are looking for an easy way to create a focal point, consider installing a border with accent tiles. This will allow you to use a splash of color in an otherwise plain design or break up a design that would look too busy without a simple display to pull the look together. If you have decided that this is the look for you, the next thing you will want to determine is at what height a border would best flatter your shower stall. There are multiple locations where it can be placed, so read on to see which option best suits your space. 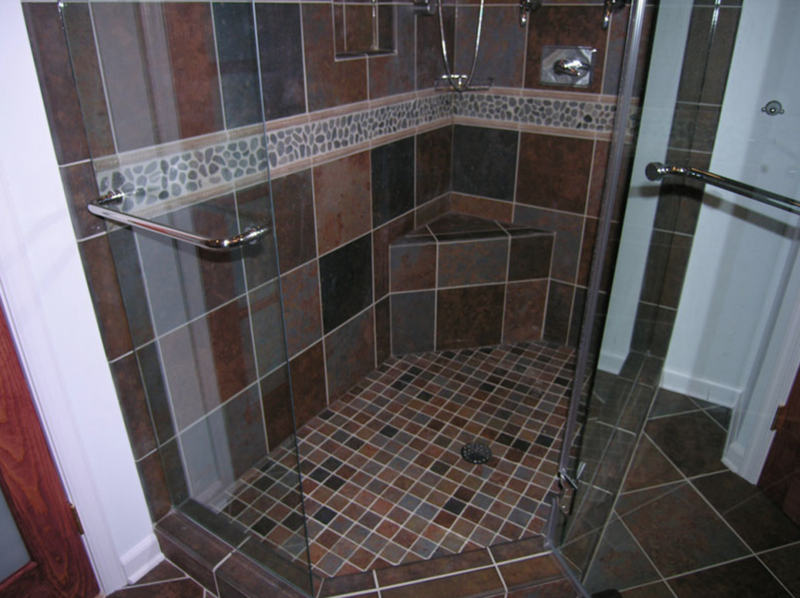 Placing a border of accent tiles at the very bottom of your shower stall will give it an anchored look, similar to the way trim is placed in various rooms of your home. It is a minimal way to add style to the space without overwhelming it. If you like the idea of having an accent towards the bottom of the shower space, you can also choose to create a border parallel to the perimeter of your stand-in shower on the floor instead. Installing the design one tile inwards for spacing will be enough to showcase this creative idea. The same idea is reversed with the top row accent feature, giving the space the same finished look of trim. While this choice seems very similar to choosing a bottom row accent, be aware the having a top row border can make the shower stall look smaller and the ceilings appear shorter if you have a smaller sized area to work with. This will mostly work best with taller, larger shower spaces, so be sure that this look will benefit the bathroom you are working with. Installing accent tile at around waist height is a good way to continue a possible wainscot-style design that may already be in your bathroom. Take into account the height of your ceilings. If they are low, keep your border at a little lower than waist level so it doesn’t appear as if the space is being cut in half, resulting in a disjointed look. If the ceiling is high, go a little bit above waist level to prevent the same problem. If possible, mark the height prior to installation on your walls with erasable ink to be sure you are happy with the placement. Installing your border at eye level is one of the most flattering looks for most shower stalls. It draws the eyes immediately to it and emphasizes it as the main attraction of the space. It is also the most complimentary section to incorporate a separation of the rest of the design as it makes the ceiling look taller. Be sure to place the border at least a foot from the ceiling but no more than twenty or so inches down for best results.